Color. What other factor in art is so simultaneously fascinating and frustrating for artists? Numerous books have been written on the subject; some are less than worthwhile, some are good, some are excellent, and a few have become so relied on that over time they have become standards. Each takes a certain approach to the subject, emphasizing color choices, color mixing, experimentation, analysis, etc., but of the many books on color that I’ve encountered over time, there always seemed to be key parts of the puzzle that hadn’t been addressed yet — a certain kind of book on color that was missing. I didn’t really know what that book was until James Gurney wrote Color and Light: A Guide for the Realist Painter. 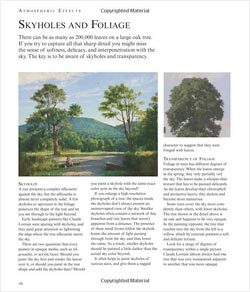 In Color and Light, which has just been released, we get the printed version of having an experienced painter leaning over our shoulder, giving us his best advice and taking us beyond the basics into the subtleties of the practical application of color in the process of creating paintings. This is the “other” book on color, the one that takes the practice of working with color, and the understanding of color and light and how we perceive them, to the next level. Gurney, who I have written about previously on several occasions, has culled a treasure trove of insightful observations, practical tips, experimental trials and artful technique from years of painting a wide range of subjects in a variety of visual approaches. He has been a renowned illustrator, portraitist, landscape artist, plein air painter and scientific artist; and beyond that has for years been a restless experimenter, investigating the work of master artists, thinking about and working with color in all of its aspects as related to painting. 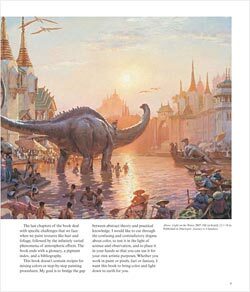 For the past several years, Gurney, best known as the creator of the popular Dinotopia series of illustrated fantasy stories, has been writing a blog called Gurney Journey. Those of us who have been following Gurney Journey since its inception have reaped the benefit of a generous bounty of art related information, advice, observations, experiments, discoveries, and links that he has made available in his frequent posts over the past few years. Some of this material, along with new material culled from Gurney’s expertise as an illustrator, were codified into a book in 2009 called Imaginative Realism: How to Paint What Doesn’t Exist, which I reviewed here. In Color and Light he has also pulled from those observations and expositions (you can see some of the topics by searching for Color and Light book, or simply color on the GurneyJourney blog), but gone well beyond that into a great deal of new material written specifically for the book. While I think of this book as advanced in many ways, Gurney does go into many of the fundamentals of color and color theory, with succinct chapters on the history of color theory, pigments, the academic tradition, plein air painting, magazine illustration, chroma and value, warm and cool, local and reflected color, atmospheric perspective, color schemes, limited palettes, reflections, highlights and shadows and many others. Beginners as well as advanced painters will find a wealth of information. However, he goes beyond the ordinary with thoughtful excursions into topics like understanding gamuts, subsurface scattering, specular reflections, different natural and artificial light sources, and expert techniques for handling difficult problems like reflection and transparency, fog and mist, skies and foliage, nocturnes, cloud shadows, and premixing colors for a painting. Though some of the information may be familiar, I think that most artists will find the book to be a treasure trove of small but significant revelations, as if dozens of little “Ah-ha!” lightbulbs (of varying spectrums) were appearing over your head as you read. I consider this book, if not a “must-have”, at the very least a “must-see” for any representational painter. I urge you to pick it up and look through it in a bookstore. I’m a little concerned that “fine art” painters might assume from a casual leaf-through that the presence of fantasy illustrations would indicate the focus of the book is not in their direction, particularly because the fantasy illustrations often have a “jump off the page” quality to them and seem dominant. Nothing could be further off the mark, the material is exactly on target for realist painters of any background who want to get a better handle on light and color. You can get a virtual “pick up and leaf through” from the nicely extensive preview on the Amazon.com listing (click on the “Look Inside” cover image), as well as a video flip-through from Spectrum, reposted on Gurney Journey, and another on Parka Blogs. In addition to being available through bookstores and online booksellers, you can order directly from the the Dinotopia store and have your copy signed by the author. Like any book from James Gurney, this one is a visual treat; in this case illustrated with works from great painters and illustrators of the past, as well as Gurney’s own illustrations, sketches, diagrams and paintings. Just like his previous instructional book, it can also be enjoyed as a coffee table art book. Only time will tell, of course, but I think Color and Light: A Guide for the Realist Painter will take a place as a new standard text among books on color, destined to be a fixture on the bookshelves of painters and illustrators for years to come. Hi Charley, I’m a painter, comic artist and designer from Bosnia, and just wanted to thank you for the great work that you’re doing all this years. I discovered your blog a couple of days ago, and read it ALL, to the very end (beginning, actually). You made me discover a couple of great artists, you feature great stuff and you write extremely clearly and well. It’s been a great couple of days with your blog, I will keep on visiting. Cheers! Thanks, Zoran. Frankly, I’m amazed that you could go through all five years worth of Lines and Colors in a short span of time. I appreciate the compliment. This post inspired me to buy both of Gurney”s books for my Christmas present to myself. I also bought the book on amazon after reading this post. As an illustrator i was looking for a book like this. Thank you and my compliments for the blog! I became familiar with James’ art through National Geographic. Later I discovered his blog, which is one of those that fall into category “check on regular basis”. I bought his first book immediately after it was published, as well as this one. Highly recommended, indeed. This is a great find. Even though I follow Gurney Journey, I haven’t been around the ‘sphere’ that much lately, so didn’t know of this. As for some being put off by the fantasy subjects, I don’t think that could matter to anyone serious enough to actually look at one of Gurney’s pieces. 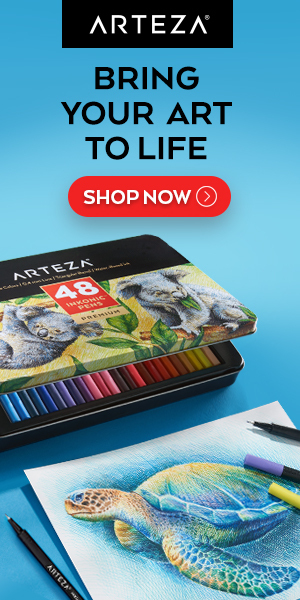 Why would the ‘jump off the page’ quality not be desirable for ‘fine art’ painters? Just curious. Perhaps I didn’t describe it well. I was trying to suggest that the “jump off the page” quality of the illustrations, as opposed to the more serene landscapes and townscapes, would make them seem to be the dominant type of image in the book, and give the impression that the book is aimed primarily at those who paint from the imagination, rather than those who paint from life. Looks like Gurney is a must own offering. Just read this book. Fantastic!!! Well laid out and easy to read and understand ( very important for a dyslexia like myself). I also just ordered Imaginative Realism.